This superb bauble decoration has been embossed, with the baubles finished with silver foiled snowflakes and intricate foil detailing. 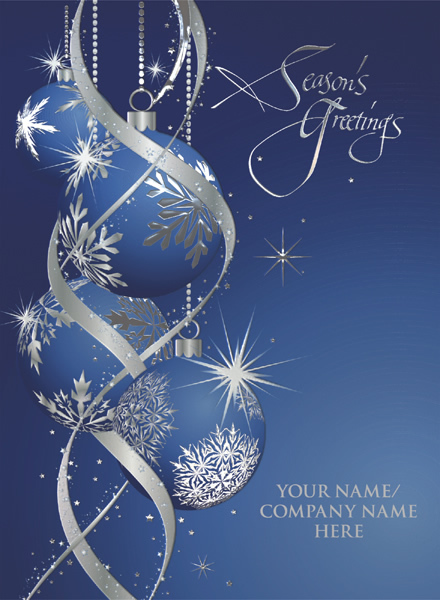 Personalise the front of this design by adding your name or company name in silver foil, below Season's Greetings, as shown. Card Finish: Silver Foil Finish. Add your name or company name in silver foil, where shown. By purchasing the Silver Sparkle Blue - Front Personalised Christmas card 10p for each card you purchase will be Donated to the Charity of your choice from the Charities listed below.